Lanham, MD: Rowman & Littlefield Education, 2011. 156 pp. $22.95 (hardcover). It’s the ingenuity that led youth in the South Bronx to turn electricity from streetlights and discarded pieces of linoleum into a party. It’s the something-from-nothing attitude that led young musicians to transform record players into instruments and to combine snatches of disco, funk, rock, and blues into the new American music. It is hip-hop genius, and, according to Sam Seidel, it just might be the antidote for what ails our public schools. 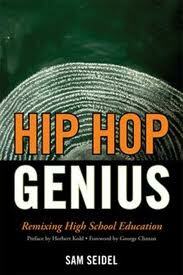 In Hip Hop Genius: Remixing High School Education, educator and author Sam Seidel profiles the High School for Recording Arts (HSRA) in St. Paul, Minnesota, an innovative charter school built around a student-run, for-profit record label where young people hone their artistic and leadership skills while learning about technology, business, collaboration, and more. The school works with youth who have dropped out or been pushed out of traditional schools—and even some alternative programs—by offering a remix of established alternative education models and its own unique contributions.